Call 1-800-546-2111 The new online store is only a sampling of our inventory and we are adding parts daily. If you don't see the part you are looking for call us we may have it! Comes with your choice of Mass Back or Poly Back. Our Mass Back sets are 100% original. They feature the same hard-rubber backing used by the factory to reduce heat and noise in your Corvette. Or, for an economical alternative, choose the jute padded, moisture resistant Poly Back. 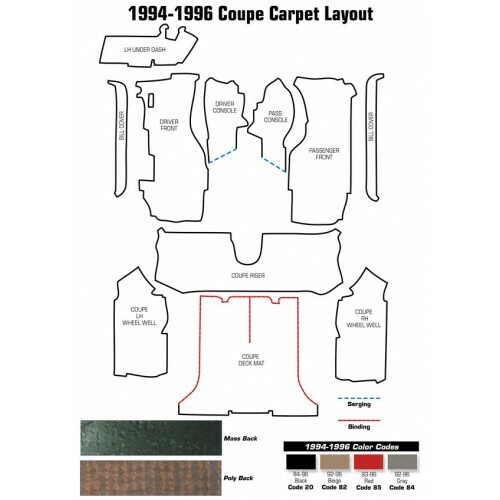 Take a look at our Mass Back Carpet for 94-96 Coupes. Note: Colors shown are approximations to assist you in determining your interior color. Actual material samples may be requested. American Made Interiors! The Largest Selection & Highest Quality Interior Products Manufactured in Reedsville, Pennsylvania. Thank you for visiting Gulf Coast Corvette Parts and Supplies, the leading site in Texas for Chevy Corvette Parts and Accessories! You'll find our site is a one-stop shop for everything you need to restore or upgrade your 1953 - 2015 Corvette. That's every generation - C1, C2, C3, C4, C5, C6, and C7. We offer a full line of new, used and reproduction parts for your Corvette. We have a full line of Corvette brake calipers, brake rotors and master cylinders. Our Corvette power steering control valves and slave cylinders as well as power steering pumps are remanufactured locally, to rigorous standards. Our high quality Corvette interiors, including original interior trim including seat covers, door panels, carpeting, dash pads, consoles and all of the hard trim. 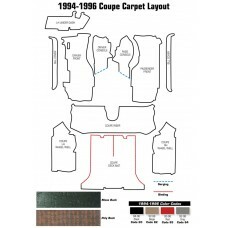 carpet, seat covers, dashes and door panels, etc. are second to none and made in the USA. When it comes to the exterior we have every available emblem, all the exterior moldings, window glass, grilles, bumpers and the best body panels in the industry including hoods, fenders, quarter panels, trunk lids and floor pans. Whether you are looking for a light, manual, electrical part, wheels or weatherstrip we can help you. For those of you who need suspension parts we have ball joints, shocks, a-arms, sway bars, control arms, springs and more. Want more horsepower or upgraded driveline components? Search our site for Coupe/Convertible/T-Top parts for Stingray, Standard, Pace Car, Collection Edition Coupe, 35th Anniversary, ZR1, 40th Anniversary, Collectors Edition, GS, Z06, 50th Anniversary, 24 Hours of Le Mans, and B2K Callaway Twin Turbo. Whether you are looking to restore to Concourse Correct or Factory Stock, upgrade, or just keep your Daily Driver on the road, remember – Gulf Coast Corvette Parts and Supplies has all the Corvette parts you need. We are also able to service your needs for other Classic Chevrolet parts such as, Chevelle, Camaro, El Camino, Impala, Nova and Chevrolet trucks, most from 1947 to current years. Pontiac Firebird and Classic Ford parts are also available.